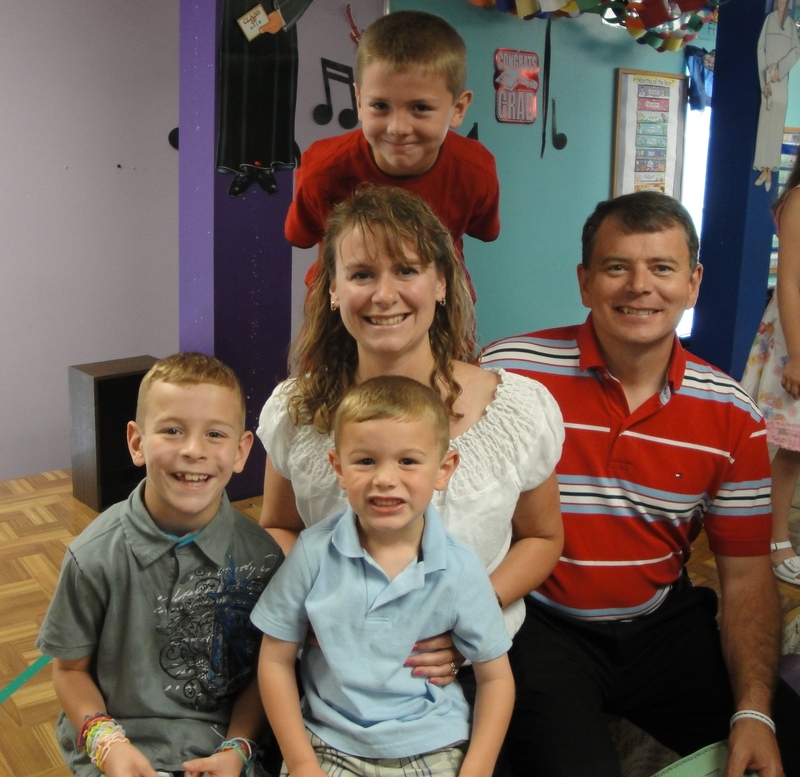 Everyone knows that being a Mommy is quite possibly one of the hardest jobs. The rules change, there is no manual, unexpected things happen. We all try our hardest, but sometimes come up short. HOW TERRIBLE OF ME!!! He is such a ray of sunshine, such a happy guy, and his Bday takes a back seat!! Luckily for me, he is also very low key. He has *never* asked for a huge party at an (expensive) venue with his whole class. He’s very content and pleased-as-punch to just invite 3 or 4 of his closest mates for a little get-together. This year’s fete was a sleep-over, where I invited his friends 2 days before. And can I tell you? They had the BEST time building Lego, playing video games, and playing football in the front yard. 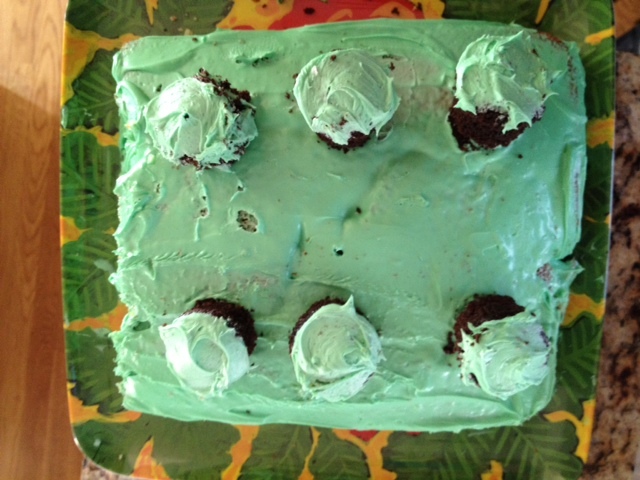 And…..the Birthday cake….I was inspired by fellow blogger who tried to make a LEGO cake for her son’s Birthday. I’m not a great baker. (if you have a good memory, you’ll remember I really don’t like to bake.) But because I strive to be a good mommy, and I know good mommy’s make beautiful cakes for their children’s Birthday, I have on occassion tried to create for my own kids. 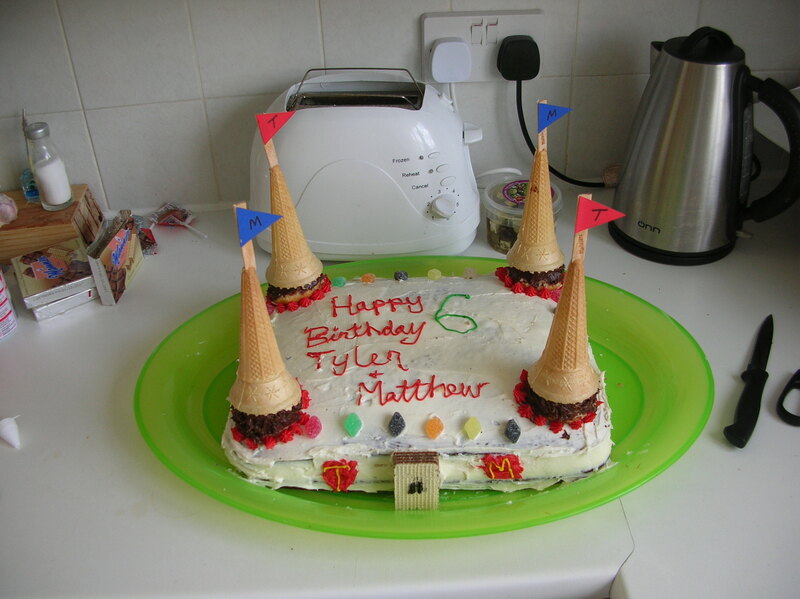 For T&M’s 7th Birthday, we were living in England, and the boys wanted a Knight-themed party, so I built a castle. But the beauty of it is, the kids don’t care. Little Guy loved it…..and he had a great 7th Birthday!! His smile takes away this Mommy Fail. 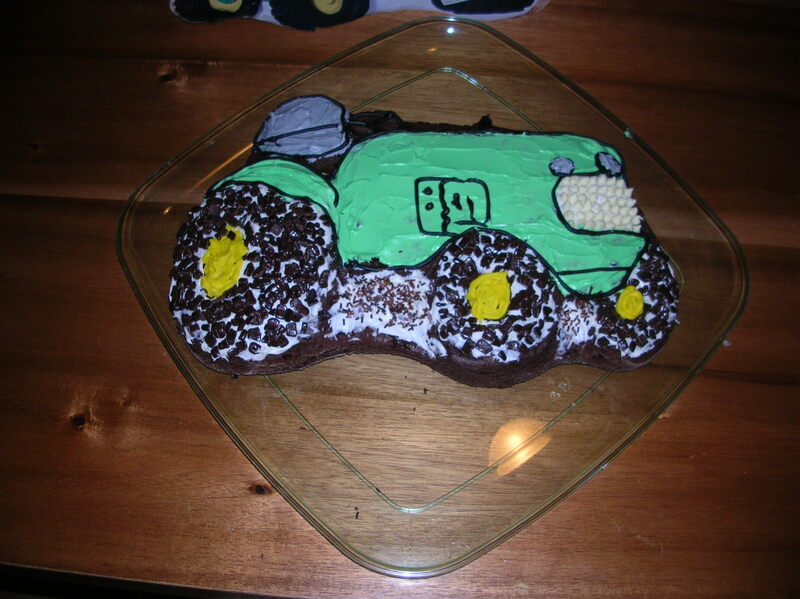 And on a side note, I’ve already got NEXT year’s party all planned….and I will call the Baker! Cheers, all! I’ve never been big into baking. I love to cook. I don’t like to bake. I think I figured this out sometime in my teen years. I have been cooking since I was about 10 or 12 years old. I enjoyed “experimenting” in the kitchen. One of my first “culinary inventions” was when I was heating up some Chef Boyardee Ravioli or Beef-a-roni for lunch. I instinctively knew that it “needed a little something.” I went through the spice cabinet, and found some Italian Seasoning…..sprinkled some in….stirred. Voila! And then, I added some Kraft Parmesan Cheese on top. What an improvement! With cooking (vs. baking), there is so much more lee-way. You can add, deduct, switch ingredients, substitute, etc. Rarely do I “mess up” a recipe, because I have a good foundation of cooking skills and have a pretty good understanding of what-goes-with-what. However, Baking is a whole different beast for me. From my early attempts at baking, I learned that recipes have to be followed to a T. Exact measurements had to be used. Skip an ingredient, or short-change one, and the outcome could be a complete flop. And I have learned that the hard way—-more than once. Flat cakes. Hockey puck scones. That is one of the reasons that I have a standing rule that if you are invited to my house for dinner, it is BYOD….Bring your own dessert. I write all this as I just completed a major baking-blitz in my kitchen. Each Sunday, a member of our church volunteers to host “Coffee Hour.” The host brings in cake or cookies or crackers or bagels. It doesn’t have to be home-made; store-bought is fine. After going to our church for the last 3 years (not every Sunday, mind you), we figured it’s time to “Give Back” since our 3 boys LOVE the goodies brought to Coffee Hour. Yes, I just said store-bought items are fine. But that’s just not me. I clearly have the time and energy to (gulp) B….A….K….E. (plus, I have all those apples…..). Between yesterday and today, I have baked 12 banana muffins, 18 apple muffins, 18 wild blueberry muffins, and 3 dozen chocolate chip cookies. I’m happy to report that the banana and apple muffins came out great. The banana muffin recipe is a FOOL-PROOF recipe from my SIL. One time I screwed up one of the ingredients royally (sorry, I don’t remember my mistake), and the muffins came out fine. The apple muffin recipe is pretty simple and straight forward too. However, I’m not digging my blueberry muffin recipe. And I did an online search, and all the blueberry recipes I’ve come across are very similar. They are not bad, but they could be better. How about the CCC? Well…….I need help on this. I swear that my CCC’s never come out the same way twice. I ***ALWAYS*** use the recipe on the back of the Toll House Chocolate Chips. Once, the batter was too thick. “Clearly this can’t be right?” I thought…wanting to add some liquid. Once it was too crumbly. Last time I made the cookies (about 3 weeks ago), they seemed lacking in taste to me. Was it because I used light brown sugar (vs. dark brown sugar…..is there a difference besides color?!?!) and I may have been short on the vanilla. This time, the batter was RUNNY. I added an extra 1/2 cup of flour….still runny. I don’t care…..I’m baking them anyway. Well, the cookie tastes awesome. They came out like thin pancakes…..there was barely any cookie-dough on the bottom…..just TONS of chocolate chips. But the color and flavor was right, so I kept on baking. After the last 6 cookies came out of the oven, I looked at Hubby and told him that I have exceeded my baking quota for the year. 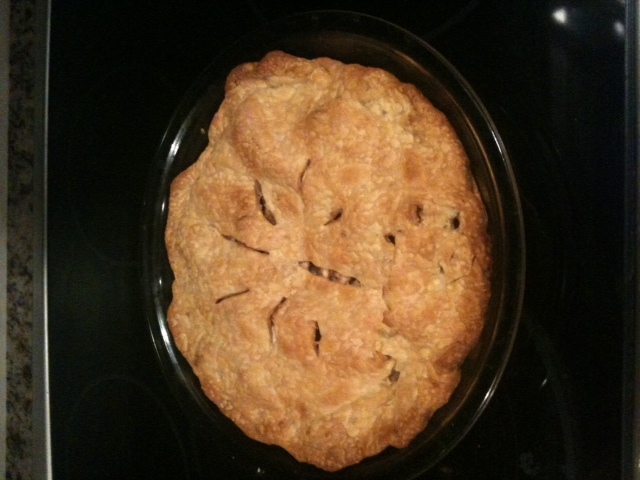 I might make one more apple pie…..just to use up more apples…..but I’m done. Bring on Thanksgiving dinner……. Yes, it’s Fall in New England! 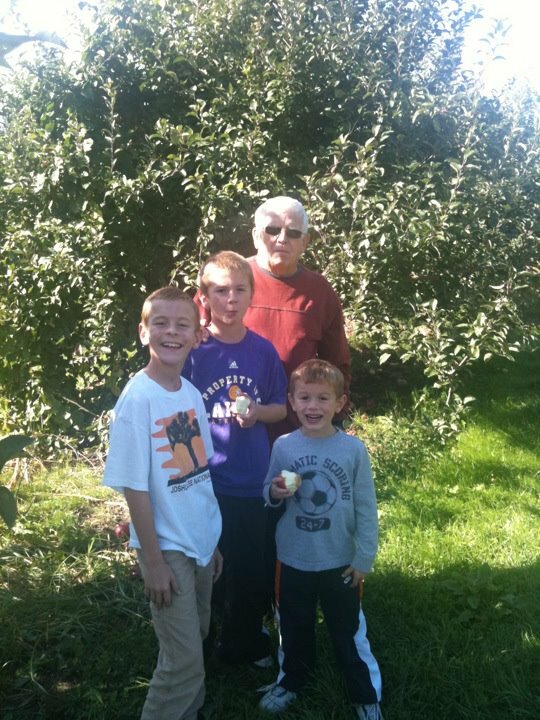 A few weeks ago when Grandpa and Grandma came out for a visit, we took them apple picking. And Holy Moley! We got a BIG BAG of apples. They are resting comfortable in our downstairs (spare) fridge. What am I doing with all the apples? What am I *not* doing? What do you like to do with your apple harvest? Any new ideas will be greatly appreciated!! All I wanted was a cup of coffee…. Over the past year I have developed a love-hate relationship with Keurig and my coffee machine(s). First, allow me to explain WHY we have a Keurig machine, and then I’ll get into my frustrations. Years ago, Hubby was told by his doctor to stop drinking (or limit) caffeine. He switched from Coke to Sprite, and from “regular” coffee to decaf. When this happened, we put away our Mr. Coffee (as I don’t drink enough to warrant making a daily pot o’ joe), and we switched to instant. It wasn’t great, but it worked for us. But I don’t necessarily drink coffee for the taste; I drink it for the effect. While we were living in England, our friend Helena had a Nespresso coffee machine, which used individual pods to make lattes. Ooooh, it was very nice. Upon our return to the US in 2008, I discovered the Nespresso carried a very nice $400 price tag. Luckily, at the same time, I discovered the Keurig coffee machine—a perfect solution—“reasonably” priced (in comparison to the Nespresso), pods were easily available in both regular and decaf options, with lots of flavors of both. I purchased my first Keuring in August 2008 at Costco. It was love at first cup. It was a work-horse until December 2010. It was starting to die a slow death, despite Hubby’s constant care of the machine. I did a little research (Hahahahaha) and found out that, sadly, the life expectancy of a Keurig coffee machine is about 2 years–right where my machine was at. I also learned that there is no way to “recycle” the machines or get replacement parts (other than the reservoir). In some cases, Keurig will send a new machine to the owner, but doesn’t ask for the old one back. They become landfill junk. Just think of all your friends who have a Keurig machine…..and if each machine was replaced every 2 years….Not a pretty picture. Despite the research, I purchased a “new” Keurig machine in January 2011 from Target. Why is “new” in quotes? I registered my machine with Keurig shortly after I bought it because from the start it had a few “hiccups.” On occasion, it wouldn’t brew a cup of coffee. But with a little jiggling, or turning it off/on, it would start right back up, and produce some java. It wasn’t often, but often enough that I held on to the receipt, and up until 3 weeks ago, the box was in the basement. On Saturday, we returned from vacation, and I needed some caffeine *desperately. * The machine WOULD NOT WORK. We tried again on Sunday, and on Monday, and on Tuesday. I called Keurig, since my 90 day return window with Target had long closed. I figured the machine would therefore be covered under the 1 year warranty. Upon TRIPLE CHECKING the machine’s serial number, Keurig-man informed me that the machine sitting on my kitchen counter has already been declared “defective” by the Keurig company, and they could not help me. Hello? Come again? Clearly the lack of caffeine was affecting my ability to listen and understand English. apparently, MY machine had a previous owner, who called it in to Keurig…..who replaced it with a freebie. Somehow, MY machine ended up in Target, who then sold me a defective machine. That’s the theory Mr. Keurig tossed out to me. Incredible. He further said that I needed to take it back to Target and deal with them; there was nothing Keurig could/would do for me. Now, granted it’s been 8 months since I purchased the machine, but most people can tell when they buy something that was returned. I can’t remember now, but I’m sure I would have noticed the way it was packaged, something missing, etc. I was NOT looking forward to being the “monkey in the middle” of this coffee mess between Target and Keurig. All I wanted was a cup of coffee! Luckily, the Target folks were helpful….a little peeved at Keurig’s handling of the situation….but they were willing to take my old machine and get a new one. Our kitchen “update” is just about done. And it looks fabulous! We opted not to have a full-on kitchen “remodel,” although we had talked about it and had sketches drawn up. After our England experience, I really liked the cook-top/wall oven look. Hubby and I measured and talked about different configurations and options. We figured out we could put in a cook-top and wall oven, but it would require all new cabinetry throughout the kitchen. I went to talk to 2 different kitchen designers, and they showed me computer-generated drawings of our “vision.” OMG! BEAUTIFUL!! However, Hubby and I talked more and more about making changes. 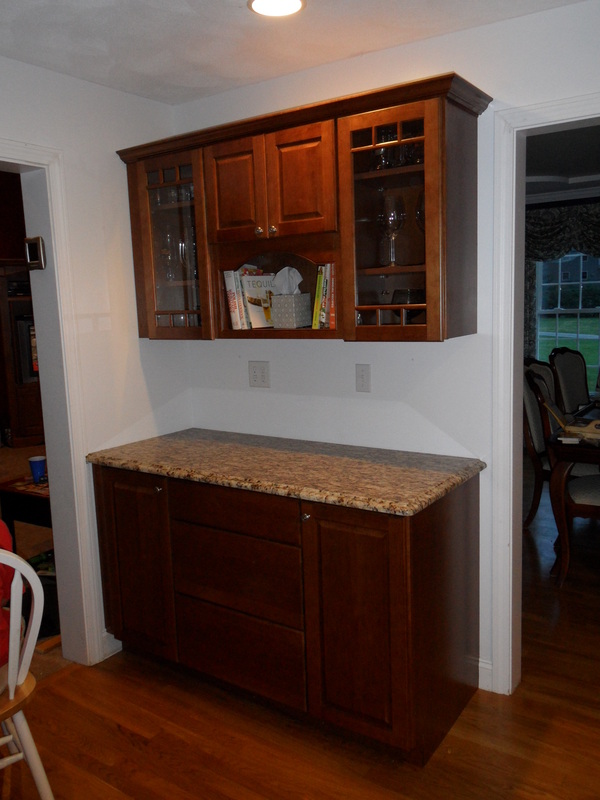 We looked at our cabinets some more…..the builder actually put in some very nice, good quality maple wood cabinets in our kitchen! 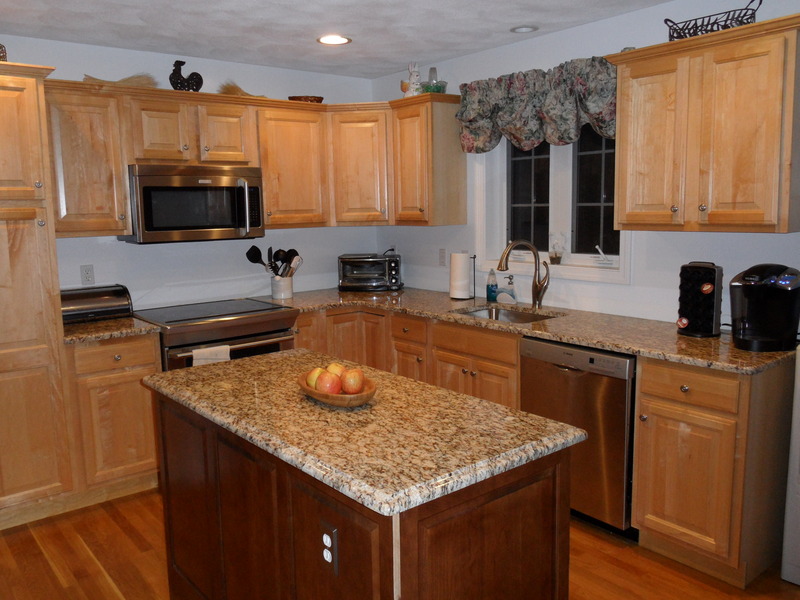 And if we were to change our cabinets, the color choice I would pick would only been a shade or two darker. Would it be worth it? We decided NO. It would be foolish (and very expensive) on our part to replace 10 year old cabinets that are still in excellent shape just to fulfill a “vision” of mine. Instead, we opted to replace all our appliances (which were dying a slow death anyway), replace our laminate countertops with granite, enlarge our island, and have a corner “hutch” installed. Since we went with the “less expensive” remodel, and because I LOVE TO COOK, hubby let me spend a bit more on a stove. I chose the Electrolux IQ-Touch because it has 5 full burners (3 of which are “double”)…something that was a MUST HAVE with my growing boys! And although it carried a hefty price tag for a stove, it did end up costing less than had we gone with a separate cook top and wall oven. We also bought a Bosch dishwasher, and we still have to buy a new refrigerator (Thanks, Sears, for discontinuing the model I had chosen!) For all our appliances, we chose to go the stainless-steel route. For many years, I didn’t understand what the SS hype was all about. I fought against it. However, I have to say that I am really, really liking the look in my kitchen. 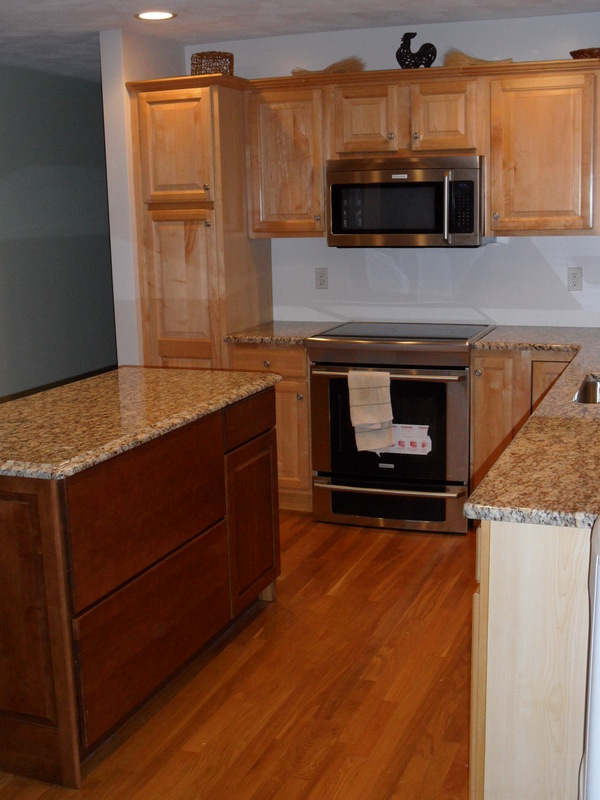 The other “must haves” for the kitchen were a bigger island and a hutch. We tried VERY VERY HARD to design an island where we could have chairs and eat at the island. However, the dimensions of our kitchen just doesn’t allow for it. Oh well. So instead, we decided to make the most of the space allowed. Our old island had 3 drawers and 3 doors. In the cabinet part of the island, I kept all my pots, pans, lids. There was a shelf inside the cabinet, and that’s where I stored my crock pot, blender, and Corning Ware. Due to the weight of those items, the shelf was starting to bow. We also wanted to replace the 14-yr old “TRASH” Box that sat just outside of the island. Our kitchen designer suggested that we choose an island with 2 giant drawers to store the pots/pans/etc, and have a pull-out trash/recycle bin drawer. Hubby and I both loved the idea! For the island and hutch, our kitchen designer suggested that because it would be challenging to exactly match 10 year old aged-maple cabinets, we go with a two-tone kitchen look. The island and hutch would be designed as “furniture” pieces to give the kitchen a more elegant look. She suggested a chocolate-colored cherry wood. The look….stunning. The island takes up no more room than the previous one, and the hutch looks like it BELONGS in the kitchen. For the granite counter tops, I chose a pattern/color called Saint Cecilia Classico. It’s a yellowish-vanilla granite with black markings, as well as chocolate spots (to go with the island and hutch) and honey-colored shadings (to go with the maple cabinets) as well as some silver markings (great for the stainless steel). A fantastic result of the granite: it makes our kitchen looks larger and brighter as a result of the light bouncing off it. Funny side story regarding my honey-colored maple cabinets (the ones we decided to keep). In the two weeks between the removal of the green laminate countertop and the arrival of the granite, we had 3 different people stop by and they all made the same comment. Tom, a good friend who as been here numerous times in the past 10 years, Nancy, a neighbor who has popped in every now and then over the last 8 years, and Deb, who has only been in my house on 2 previous occasions—they all commented that the “new maple cabinets look very nice in the kitchen!” We had to remind them that those are the original!!!! That compliment made me happy that we decided to keep them! The only thing left is to install the handles for the drawers (on order) and find tile for between the counters and the maple cabinets. Should Hubby ever read this post, he’s going think I am half-baked. One area where the VP fails in her daily duties is that I bring home an extra potato. The Lonely Potato. My kids are Not Potato Fans. Well, Little Guy will eat potatoes without grumbling—pretty much in any shape or form (unless his big bros are putting up a bigger stink than usual). The other two have always had a dislike for The Spud (unless found in a sliced, fried and salted form…either of the French or bagged variety). Their dislike of potatoes goes back to infancy. When I started them out on jarred baby food, there was one flavor (Mixed veg?!?) that had pureed carrots, peas and potatoes. It’s the ONLY jarred food flavor with potatoes. Neither twin would eat it. When I tried it, the texture did have that starchy potato-y-ness to it. As they became older and sampled “big people food,” both boys would grimace at mashed potatoes, baked potatoes, roasted potatoes, and yes, even cheesy au gratin potatoes. With the last one–the Au Gratin Potato–I thought I had a chance to convert them…..HOW COULD YOU SAY NO TO CHEESE?!?!? But they did. As a result, I don’t cook/serve potatoes very often. Maybe once a week…..nah, that’s too often. Maybe once every other week. Sometimes once a month, I suppose. But I have always followed the “I will put a little on your plate and you MUST eat it” rule. Watching M-Man struggle to put a smidge of potato into his mouth, chew (f needed) and swallow……is painful and amusing all at the same time. You would think I’m torturing my child. (I suppose he thinks I am). So, my quandary (when I am in the mood for a potato side dish) at the grocery store is….how many potatoes to buy? 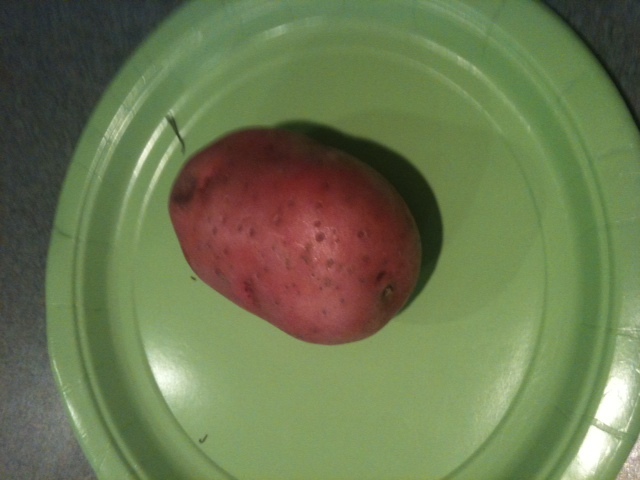 I take into account the size, shape and type of potato, as well as the dish I am preparing. Does this dish rate higher on the kid-scale than other dishes? Will today be THE DAY where they will say “Mom, you are such a great cook. I don’t know why I never ate/liked potatoes cooked this way” ? (wishful thinking) Will I be willing to eat up the leftovers? Invariably, I buy ONE POTATO TOO MANY. And it sits there…..staring with its eyes…..waiting for me to do something with it. But as mentioned above, I just don’t cook potatoes that often. By the time I do make another potato dish, it will most likely be a different dish, using a different potato. So the Lonely Potato just sits and rots. How sad. The Members of Thomas Inc.
A little too much Beverly Goldberg?